Philadelphia, PA — Two Philly cops have been charged with the assault of a man after surveillance footage revealed the officers lied about the incident. Aggravated Assault, Simple Assault, Criminal Conspiracy, Recklessly Endangering Another Person, Tampering with Public Records or Information, False Reports to Law Enforcement Authorities, Obstructing Administration of Law, and Official Oppression. The charges stem from an incident that happened in May of 2013 when the two officers pulled over 23-year-old Najee Rivera on his motor scooter. Police say Rivera got scared of the officers and drove off. Both of the officers wrote in their official reports that Rivera fell off of his scooter and hit the pavement. According to the officers’ account, Rivera resisted arrest, tried to grab a police baton, and that’s when one of the officers hit him in the face. 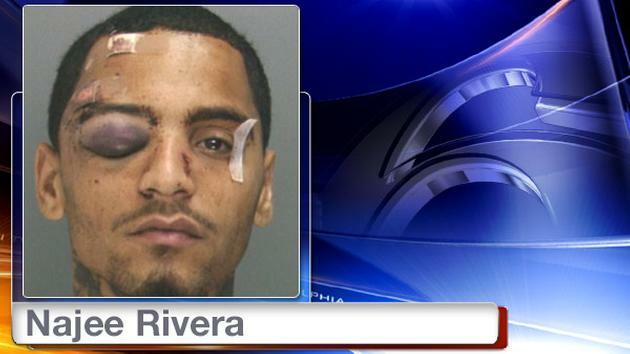 Rivera was subsequently charged with resisting arrest and aggravated assault. Their entire account of what happened was a lie. Just prior to the case going to court, a surveillance video surfaced from a nearby store. Rivera’s girlfriend, who knew Rivera was innocent of the charges, finally found the video after a long search. “The video undermined every aspect of the officers’ account of the incident. A grand jury found none of it was true except for the blows inflicted on Najee Rivera,” Philadelphia District Attorney Seth Williams said in a press conference Thursday. Williams said Rivera didn’t just fall off his scooter, but one of the officers can be seen on the video reaching out the window of the patrol car and clubbing Rivera in the head. The patrol car, without sirens or lights flashing, bumped the scooter and Rivera fell to the ground. Both officers got out of the vehicle, Williams said, and repeatedly struck Rivera with their fists and baton. “He never resisted. He never struck them. He never fought back. They just started hitting him,” Williams said. Rivera can be heard in the video screaming for help. After he was severely beaten and bleeding, he was then handcuffed and left for several minutes as he lay in his own blood. Rivera was subsequently hospitalized for a fractured orbital bone and a multitude of abrasions and lacerations to his head. “Hopefully this case will show Philadelphians that our system here works,” said Williams. However, if the “system worked” Rivera wouldn’t have been run down by two men who claim to protect and serve the city. If the system worked, Rivera wouldn’t have been charged when he is the victim. Unfortunately and predictably, the system failed. Only because of Rivera’s girlfriend and her steadfastness in seeking out the surveillance footage, will there be any chance of actual justice prevailing. Ramsey says that both officers, Robinson and McKnight have been suspended for 30 days, with the intent to dismiss from the force. All charges have been dropped against Rivera.